Is it just me or was there a toon animal morph that made the horse into a hippo yesterday? I know I saw it, it was there now it's gone. Too soon to release the product or limited time sale? What? It was released too early (read that in another thread). I saw it in the store too last night. You're not hitting my Llama I hope, If you had that combined weight on your back you wouldn't be happy to, Your being a bit tough on me with the poly count the fur is only 300K I think I kept it pretty low considering I had to nearly cover the whole body. Anyway thanks for your support I know how you love to demoralize my creations LOL!!! You can download the files at my freebie site, the link to my freebie site is in my signature. 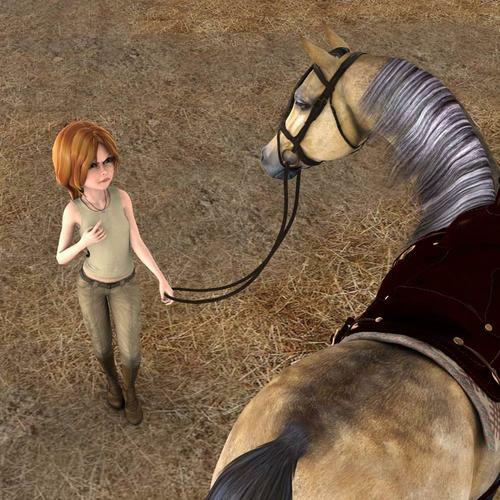 The files are rtencoded against the blMilHorse.obj. More instructions are in the readme. I created an UV set for the new horse to take Millenium Horse textures, I also created a clone to auto fit your old items to the new horse. I also included some materials for easy application of the old textures ( LnL Ultimate Horses, Mil Unicorn, Fantasy Unicorns and the textures that are included in the Mil horse Bundle) . . . Played around with this a bit last night -- the clone works beautifully! As do the material buttons, thanks CauriB! Snazzy! How did you do that? Excellent! I was going to try to squeeze this into my schedule, but I probably wouldn't have gotten it done until January. Thanks for doing this! Wow that reminded me of a daydream/not quite awake dream I had as a kid had a shelf up on the wall above my bed where my "Barbie Doll horses were stabled,and laying in my bed one morning it was just barely daylight I looked up at the horses and one of them turned it's head ,looked at me ,shook its mane out,reached down and scratched it's foreleg and then when back into the normal position ...........needless to say I told my mom this she told me I had a vivid imagination ......I was positive the toys were coming to life when I was sleeping for years after that ......except I do have to ask Wendy what's with the dress on the horse?? a few asked if I was going to dress the horse when I said I got it, so I did! thanks! I'm in the lamh plugin beta group and just knew i had to try it out on the Horse 2, its very fun! Sooo ... I've got everything downloaded and am now installing and ran into a gotcha with Western Gear. Doesn't take much to confuse me when I'm in the after 'glow' of a migraine and my brain still hurts. DSON Core: Install files for DS4.5+. These are trx.exe files I'd normally ignore, but with the DSON Importer for Poser, I now need to install these. Poser Companion: Install files for Poser runtime. These are the dpc.exe files. To use Genesis / Horse 2 products in Poser, I need to install these. Poser Core: What the heck? It's a dpc.exe file, so these must be the normal files I'd install for Poser, and I can ... in this case ... ignore the DSON Core install files. Right?!? The material zones probably aren't named the same as in the original MillHorse. So you'll need to manually apply the textures. That would be my guess, anyway... I haven't had a chance to try it yet (I'm at work). Hm. 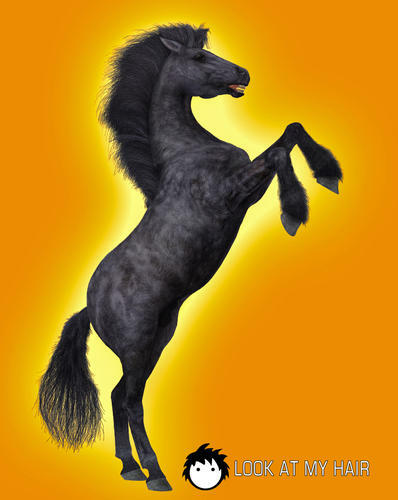 Maybe it would also be worthwhile to do a clone shape and UV map for the Poser Horse? There are some freebies for that horse that I'd really like to convert for Horse 2. As carrie58 already said you need to apply any other than the included textures manually and save them as a .duf file. I did this with the texture sets I own and included them as a bonus. 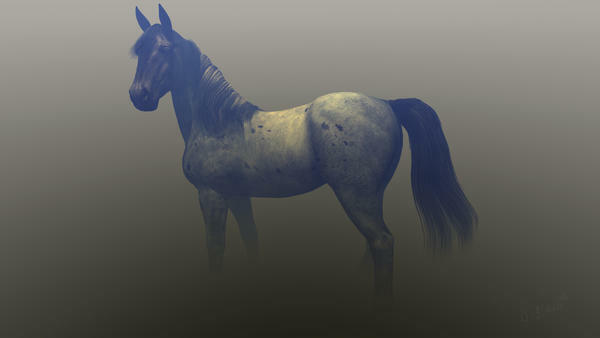 A clone shape and UV map for the Poser Horse won´t be easy to create because the geometry is to different. The DAZ Horse 2 obj is the Millenium Horse obj minus the hair with a new shape and an altered UV map so it wasn´t too difficult to build a clone and remap the horse. Somebody is having a bad day. Genesis Mavka and horsey2 in the barnyard. Edit: The levels changed the color so I'm substituting the non-photoshop-leveled straight out of DS version. Sorry about that. Love it! I wonder how well Poser dynamic hair will work? three times, and I still have no textures anywhere in the Poser runtime. Got it installed. The mane, forelock and the tail are horrid in my opinion. The forlocks are basically two single planes with transmaps applied to them. You have to load both the manes (R & L) to get the forelock looking just OK... it's very long too, there are no shortening morphs to pull it up. The mane has barely any movement morphs at all and the tail... not sure what that's all about... 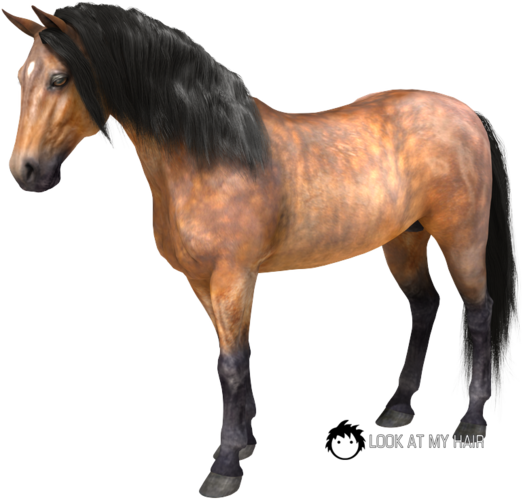 The main horse looks great but can't wait for someone to make a nice mane, forelock and tail set, perhaps with fibermesh that one can load each. I think one of the things I would have done differently is make the forelock separate. Plus there is that huge gap with no hair from behind the ears down to where the mane starts. That looks really odd, like the groomer had a "whoops" moment. Not impressed with this area of the new horse in the least. I won't return it but I won't use it until there is an alternative set offered. Yea, the saving grace! Can't wait even more now for that plugin to hit Carrie! I have just bought and downloaded the mill H2 pro bundle, but I noticed that there is no DSON CORE files for, the Wagon Trail 1 & 2, or the Barnyard. has anyone else noticed this.???? I think I may be missing some files, but just wondered if anyone else has had this problem. Those three products are Poser products, so they don't need to use the DSON Importer. Thank you very much Satira Capriccio. This multi plaform thing can be SO confusing. I'm rather discouraged with the mane, forelock, and tail. Very difficult to get it looking decent. Also, many of the mane and forelock pose controls are either on or off. No incremental settings (at least in Poser. It's either 0 or 1). So, if you want a mane that is kinda windy, no such luck. It's either full on flying in the wind or it's flat against the neck. Also can't turn off sections of the mane. I wanted the forelock to be split with half to the left and half to the right, so thought I'd use both manes and turn off the neck parts. Nope. Doesn't work. It just amazes me people create such incredible and gorgeous hairs for human figures, but we get this ... ancient ... something ... with the latest and greatest DAZ figure. The forelock and mane are one reason why I didn't use the Mil Horse all that much. I'd hoped that Horse 2 would be improved. It also appears Horse 2 doesn't work in the Poser hair room. Nothing is selectable when you try to make a group :( So much for that idea. Maybe I'll just use bald horses like I usually settled for with the Mil Horse :P Especially, since the forelock didn't work with the draft / heavy horse morphs ... and I rather like the draft horses. I haven't tried using a TriAx figure in the hair Room (come to that, I haven't tried using the hair room) but if you need to select a target bone when adding hair use the SubD bone, rather than one of the posing bones, as that (at least with Genesis) is what carries the final mesh. 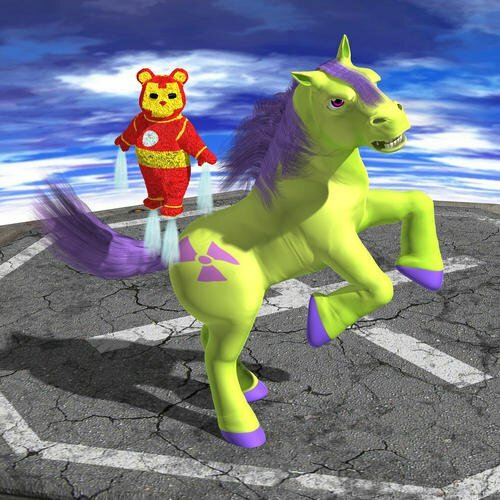 The render below uses DAZ Horse 2 / Toy Pony / Pretty Ponies as the Pony-Hulk. Iron Bear was originally supposed to be Iron Pony, but my attempts to make the texture map failed miserably -- The DH2's UV map may be excellent for realism, but not so good with the Toy Pony. Even simple quarter-marks distort, like that radiation symbol. I've got a number of super-heroes I'd love to do pony emulations of -- if somebody could do a more toy-friendly UV with a seam guide I'd really appreciate it.